Sweating is a natural body function needed for the regulation of body-temperature. There are five million sweat glands throughout the body and about 2/3 of these gland are located in the hands. The secretion of sweat is controlled by the sympathetic or (vegetative) nervous system. In some people (1% of the population), the nerves are over-stimulated and sweat is produced far greater than needed to keep a constant temperature. This condition is referred to as Hyperhidrosis. 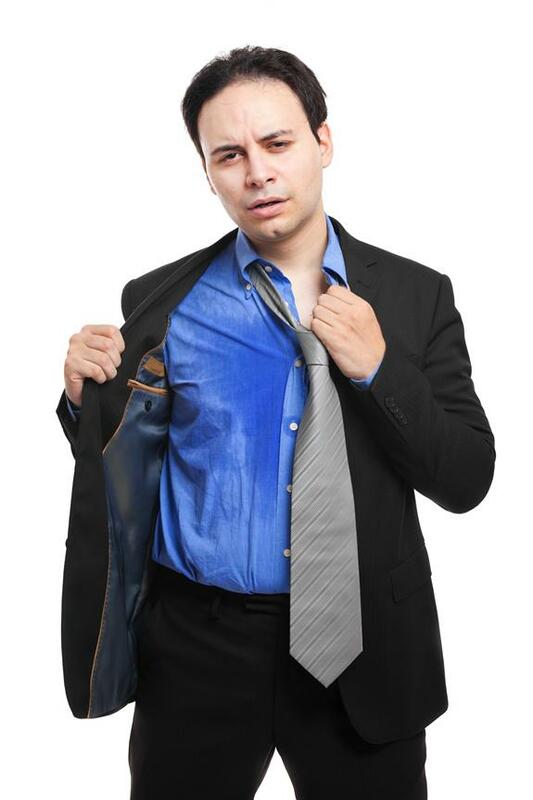 Excessive sweating may be episodic or continuous. Profuse sweating may be caused by warm weather, emotional stress, or occur without any reason. Hyperhidrosis may be part of an underlying medical condition (secondary Hyperhidrosis) or may be of unknown cause (primary Hyperhidrosis). In general, secondary Hyperhidrosis involves the entire body. Diseases or medical conditions causing secondary Hyperhidrosis include hyperthyroidism, endocrine treatment for malignant diseases, psychiatric disorders, obesity and menopause. Primary Hyperhidrosis, or sweating without known cause is also termed idiopathic or essential Hyperhidrosis. This is a much more common condition than secondary Hyperhidrosis and may occur in one or several location s of the body. The hands, feet and armpits are the most common locations. The condition usually starts during adolescence and is lifelong. Nervousness and anxiety can precipitate excessive sweating. 1. Hyperhidrosis as part of an underlying condition (secondary hyperhidrosis) Some conditions can promote excessive sweating, as a rule involving the whole body: Hyperthyroidism or similar endocrine diseases can induce hyperhidrosis. Endocrine treatment for prostatic cancer or other types of malignant disease can induce hyperhidrosis. Severe psychiatric disorders can induce hyperhidrosis. Obesity and menopause can also induce hyperhidrosis. 2. Hyperhidrosis without known cause (primary or essential hyperhidrosis). This is a far more frequent condition than secondary hyperhidrosis, and usually appears localized in one or several locations of the body (most often hands, feet, armpits or a combination of them). Primary or essential hyperhidrosis usually starts during childhood or adolescence and persists for life. In addition, nervousness and anxiety can elicit or aggravate sweating, but psychological/psychiatric disturbances are only rarely the cause of the disorder. Palmar Hyperhidrosis: Excessive sweating of the hands is, generally, by far the most distressing condition. The hands are much more exposed in social and professional activities than any other part of our body. Many individuals with this condition are limited in their choice of profession, because unable to manipulate materials sensitive to humidity (paper etc.) or reluctant to shake hands. Some patients arrive to the point of avoiding social contact. The degree of sweating varies and may range from moderate moisture to dripping. Most patients notice that their hands not only feel moist, but also cold. Axillary hyperhidrosis and hyperhidrosis of the armpits can be embarrassing, causing large wet marks and sometimes a white halo of salt from sweating on the cloths. Plantar Hyperhidrosis and other locations: Less frequently, hyperhidrosis is located only on the trunk and/or the thighs. Other patients suffer from copious sweating of the face. Many individuals suffer form a combination of the above categories. Sweating can appear suddenly or can manifest itself more continuously. It can be elicited by high outside temperatures or emotional stress, or appears without any obvious reason. Generally, hyperhidrosis worsens during the warm seasons and gets better during winter. ANTIPERSPIRANTS: Are usually recommended as the first therapeutic measure. The most effective agent appears to be aluminum chloride (20-25%) in 70-90% alcohol, applied in the evening 2-3 times per week. Xerac AC or Drysol are the brand names. Generally, this treatment is sufficient in cases with light to moderate hyperhidrosis but has to repeated regularly. IONTOPHORESIS: Can be tried if antiperspirants have not lead to the desired result. This method consists in applying low intensity electric current (15-18 mA), supplied by a D/C generator, to the palms and/or soles immersed in an electrolyte solution. The procedure has to be repeated regularly, initially in 20 minute sessions several times per week, gradually stretching out the interval between treatments to 1-2 weeks. The results vary: Many patients suffering from light or moderate hyperhidrosis, are happy with this method. Some may consider it too time-consuming or inefficient, and comparably expensive. It is difficult to apply in axillary areas, and impossible to use in diffuse hyperhidrosis of the face or the trunk and thigh regions. Equipment specifically designed for the treatment of hyperhidrosis at home or in the physician's office is commercially available from different suppliers. Call the R.A. Fischer Company at 800-525-3467 for more information on iontophoresis. Iontophoresis is a second line treatment if antiperspirants fail. This treatment consists of applying low intensity electric current to the hands or feet immersed in an electrolyte solution. The procedure has to be repeated regularly several times/week. The results vary, but many patients believe it is too time consuming and expensive. It is difficult or impossible to treat axillary or facial Hyperhidrosis with this method. DRUGS: There are no specific drugs available against profuse sweating. Psychotropic (mostly sedative) and/or anticholinergic drugs are often tested but show usually too many side-effects before any noticeable result can be achieved. Hence, they are, as a rule, not recommended. In those few cases who suffer from profuse sweating on the trunc (but not the extremities), a low dose of anticholinergic agent can slightly alleviate the symptoms without rendering life unsupportable from side-effects (dry mouth, accommodation difficulties of the eyes, etc. ), but a dosage necessary to normalize the amount of sweating will rarely be tolerated. PSYCHOTHERAPY: Very limited effect in the absolute majority of patients. Psychological problems are in most cases a consequence of hyperhidrosis, not the cause. Hence, psychiatric or psychopharmacologic therapy cannot cure this disorder, at most it may help the patient to accept living with the problem. SURGERY: Excision of the axillary sweat glands. Patients with axillary hyperhidrosis who are unresponsive to medical therapy can be effectively treated by excision of the axillary sweat glands. If sweating extends beyond the hairy portion of the axillae, several skin incisions may be needed, sometimes resulting in formation of hypertrophic and/or constrictive scars. 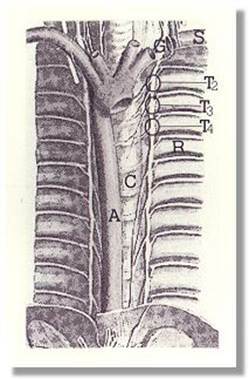 Sympathectomy: The principle of sympathectomy is to interrupt the nerve tracks and nodes (ganglia) which transmit the signals to the sweat glands. Basically, this can be achieved for all locations in the body, but only the nerve nodes responsible for the sweat glands of the palms, the armpits, and the face are accessible without the need for a major surgical procedure. Today, the surgical treatment of choice for moderate to severe palmar and facial hyperhidrosis (but also axillary, especially if combined with palmar sweating), consists of a surgical procedure known as Endoscopic Thoracic Sympathectomy. This minimal-invasive endoscopic technique has been developed in recent years in a few hospitals in Europe, superseeding Conventional Thoracic Sympathectomy, a very traumatic procedure performed in the past. The endoscopic technique is safer, if performed by a surgeon experienced in this type of procedure, and leads to definitive cure in a large percentage of patients, leaving a smaller scar in the armpit. Individuals with combined hyperhidrosis of the palms and soles have a good chance to improve the sweating of their feet after an operation aiming to suppress sweating of the hands. Isolated plantar hyperhidrosis can, however, only cured by Lumbar Sympathectomy, an open abdominal procedure with numerous potential complications. Diffuse hyperhidrosis of the trunk or general sweating of the whole body cannot be treated by surgery. OTHER TREATMENT METHODS: "Alternative Medicine" Many patients, disappointed by the treatment offered by their doctors, have tried different methods of alternative therapy including homeopathy, massage, acupuncture, and phytotherapeutic drugs. In almost all cases without noticeable improvement. "Lasertherapy:" Some desperate patients have undergone this kind of treatment, involving direct irradiation of the palms and resulting in 3rd degree burn lesions with heavy scarring, without any effect regarding sweating. This technique is absolutely contra-indicated. Hypnosis: There are no systematic studies on this method. Few patients have tried it, reporting poor results on palmar hyperhidrosis. Botulinin toxin: A family of toxins produced by a bacteria known as Clostridium botulinum. This toxin is one of the most lethal poisons known, interfering with the effect of the transmitter substance acetylcholine at the synapses (the contact point of a nerve ending with another nerve cell or a muscle) and leading to progressive paralysis of all muscles in the body, including the respiratory muscles. In extremely low doses, botulinin toxin has been adopted in cases with localized muscle hyperactivity (lid spasms, torticollis, etc. ), resulting in a reduction in transmitting impulses to the muscle. No official reports are so far available regarding this treatment in hyperhidrosis. Reduction in activity of the autonomic system (dry mouth, bladder paralysis, bowel inactivity) is a known phenomenon in severe botulism (botulinin poisoning), but will hardly be achieved without detrimental side-effects on the muscles. All in all: An underlying disease should be looked for. However, most cases, particularly those involving the palms, soles, groin, and axillae are of a functional nature. Psychiatric treatment is usually valueless in emotional hyperhidrosis since the process simply represents over-responsiveness to ordinary stresses. Anticholinergic drugs are usually valueless and often harmful because of the production of dry mouth, urinary retention, and blurred vision. Mild sedation with phenobarbital in a 30-mg dose given three times daily, may be the extent of systemic therapy. Put antiperspirant on you feet first thing in the morning or right after the shower or bath. Remember to let your feet cool before applying the antiperspirant so there will be good contact with the skin. Wear socks with a high cotton content. Wear white if you can. White cotton socks and dress colored socks in all cotton are available at most stores. Change your socks at morning, noon, and after work. Powder you feet with Zeabsorb AF powder or apply powder inside your socks so they will be pre-powdered when you put them on the morning. For children, mothers will find a plastic bag lining the sock drawer effective in keeping the powder in one area should it leak from a pre-powdered sock. This also reduces inhalation of the powder by the child. Wear unlined leather shoes if possible. Twice a week soak, the feet in a strong tea solution. The tannic acid in the tea reduces sweating. At the end of day when shoes are removed, rinse the feet an apply a moisturizer. This will help prevent the skin from over-drying and cracking. Prescription medication may be helpful if applied at night to cool the feet. Botox injections can help with hyperhidrosis, and is now FDA approved. This is a very good alternative for patient’s who do not respond to Dry sol. The only drawback is that it requires 25 to 50 injections per site. Botox helps keep your hands and underarms absolutely dry for 4 months and then, after this, most people start sweating again after one year. Iontophoresis has help certain patients find relief. 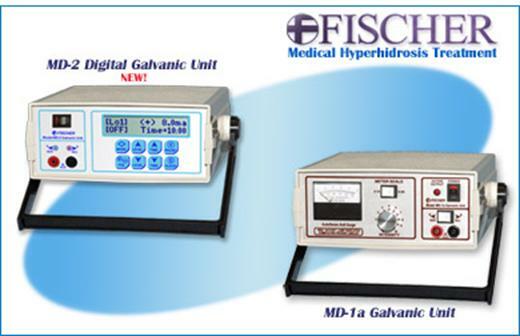 Call the R.A. Fischer Company at 800-525-3467 for more information on iontophoresis.